As you can tell from the fades and rips, that paper has been there a while. And on more than one occasion it has made me think twice before making a purchase. Better yet, it has sparked conversation when other people see it. 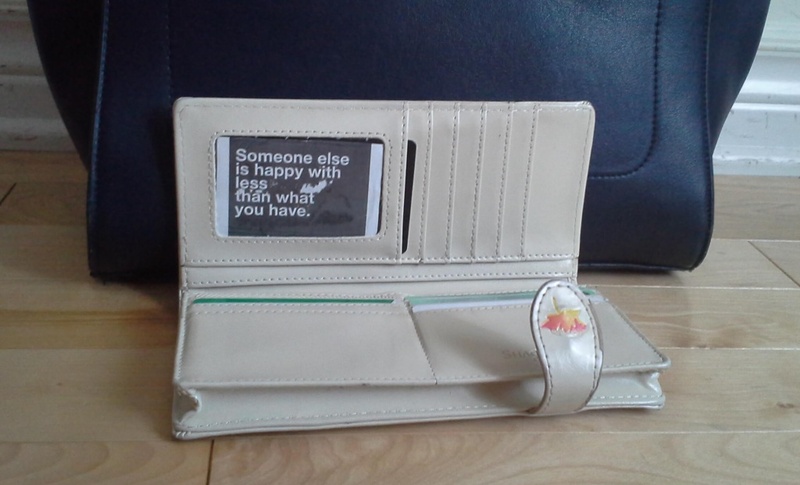 One time I was buying groceries and the cashier who was helping me noticed the quote in my wallet. She generously shared her story and journey to minimalism, explaining that she had recently made a job change and house change. She said that her health was so much better since simplifying all areas of her life. I like keeping this as a little reminder when making purchases: Is this something that I really need? Will it add value to my life? Do I take some things for granted? Maybe we can get an initial feeling of happiness when making a new purchase. But after time goes on, the happiness usually fades, or we might realize that we now want the next great thing that money can buy. You don’t need stuff to find true happiness. When we choose to be content with what we have, it brings a new freedom. Contentment calms our hearts. Consumerism pushes us to have more—to have the next great thing that money can buy. Being content and thankful might mean rejecting some of the material things we want in the moment in order to step back a bit and discover what we truly need right now. For more posts, sign up for the Simple Adventure Newsletter, or like the facebook page!